Original Dungeons & Dragons Game Set - Moar Stuff - You don't need it but you know you want it. This Original Dungeons & Dragons Game Set is probably not something the casual player would want. It’s not just an early edition of D&D. No, it’s actually a premium, deluxe edition of the original D&D® “White Box”! We’re talking pre 1st edition here. This is a copy of the original Dungeons & Dragons boxed set as published by TSR way back in 1974. The original revolutionary set of books (included three small rules booklets in a white box) introduced concepts that have persisted throughout later editions all the way to the present, 5th edition, rules. Each booklet features new cover art, but the interior retains the nostalgic original art. All of the booklets are packaged in an engraved illustrated wooden storage case along with a set of dice. The paper used is of high-quality and the booklets are bound by staples (just like the originals). 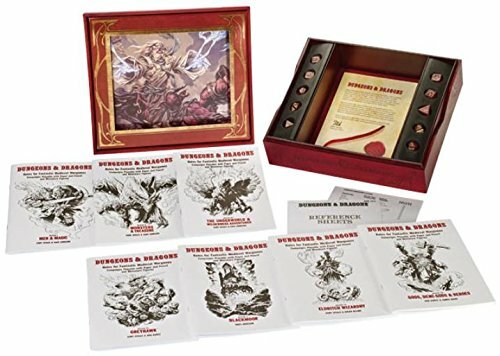 This is a bit expensive on the expensive side but, it would make an awesome gift for that special D&D player in your life. I guarantee s/he would cherish it for a long time. Dimensions: 6.1 x 11.9 x 12.9 inches. Officially licensed by WOTC because, if it wasn’t, somebody would be getting sued. Your inner geek desperately wants this.